jollyliteracy.com and just2ducks LLC has over 40 years combined teaching experience. What a great team of teachers to design Jolly Phonics and Jolly Grammar. We were blessed with products for review, and I utilized them with my reluctant reader. 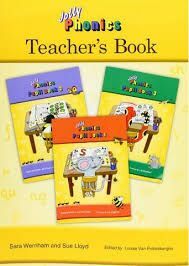 Jolly Phonics Student Book 1, 2, and 3 will teach letter sounds, blending, and segmenting. 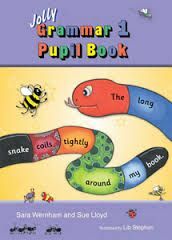 Jolly Phonics book 1 begins at the very beginning with letter sounds. They do not introduce them alphabetically, but rather in an order that the student can quickly read words based on the letters they have learned so far. The workbook has them writing the letter and sounding out simple words. We chose to write the words from each page on an index card to use for review later in the afternoon. My 8 year old seemed to have forgotten all he knew over the summer, so rather than skipping Book1, we went ahead and used it. It was a great refresher for him, and he was able to do upward of 4 letters a day. The lessons themselves are very short and sweet. Easily can get done in under 10 minutes, which does help with students who don't prefer worksheets. Each sound that is introduced, has a short story to go with it. Within that story is a memory jogger to help the student do an action with a sound to remember it. These stories are taking and put into song form to help aid the student through listening. My 8 year old didn't really enjoy the songs, as they were a bit 'babyish' for him. My 2 year old though enjoyed them! We will keep playing it for her and she will quickly learn her sounds. All of the information for teaching is included in the Teacher Book so there is no guessing what or how much to do for a lesson. 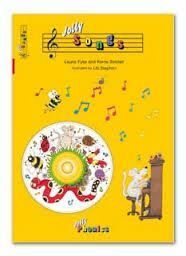 The beginning of the Teacher's Book gives helpful information for teaching letter sounds, how to write the letters, learning how to blend sounds for reading,and identifying sounds in word. Student Book 1 primarily focuses on lower case letters. Student Book 2 focuses on capital letters. There is quite a bit of emphasis on Tricky Words which I really enjoyed. I think these are ones that really need the focus. There are fun activities, a place to write words dictated, and emphasis on digraphs and blends. Book 3 continues where Book 2 left off and gets into some harder words. After Jolly Phonic is complete, you move into Jolly Grammar. We didn't get into the Grammar portion as we were still working through Jolly Phonics. 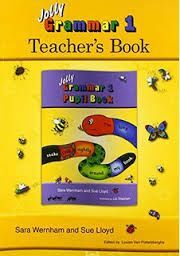 The Jolly Grammar has structured lesson plans just like Jolly Phonics did. The emphasis is on Grammar and Spelling. There are additional extension activities that may require art supplies but it seems most you will already have on hand. Jolly Grammar did have some things the teacher needs to do in preparation, like getting word walls reading and flash cards. Nothing too crazy. See what my crew mates thought of Jolly Phonics and Jolly Grammar by clicking on the banner below. This is a picture of a homeschool Mama! 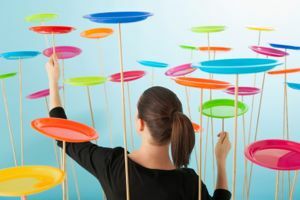 Each plate represents a child, the household, our husband, our finances, meals, appointments, field trips... you get the picture. God's big hand spread underneath your feet to catch any plates that fall, or to steady you if you stumble. Enlivenze LLC has some great 3D puzzles including the FlipStir Puzzle Tyrannosaurus Rex which we recently reviewed. Geared for ages 7 and up, this puzzle is unique in that it is all self contained. This unique puzzle has 10 pieces, each with a part of the complete picture on it. They are in a cylindrical, enclosed container that has a wand attached to the lid to help maneuver the pieces. 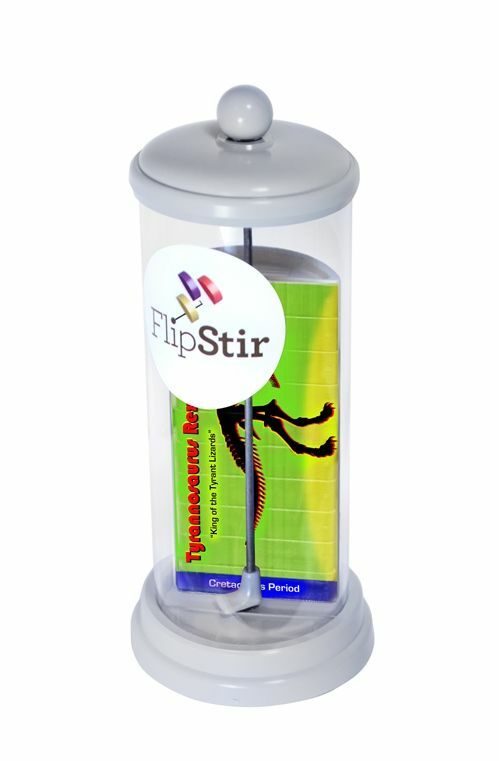 Using gravity, the wand, and movement, you get the pieces in the correct order to make the picture which is conveniently pictured on the bottom of the FlipStir Puzzle. This guy is 8, and it was certainly more of a challenge for him to work the puzzle than his 14 year old brother. He was glad to keep the box around as he really liked looking at the photo on the box rather than on the bottom of the FlipStir Puzzle. It took him maybe 20 mins to complete the puzzle. He was so proud to have figured it out. I think it would be fun to set a timer and see if he can do it quicker each time. This would be perfect to have a contest with the kids to see who can do it the quickest, and even include Dad in the challenge. These puzzles help teach critical thinking, and special relations. There are 2 puzzles in Level 1, including this T-Rex. The other is Rainbow Pencils. There are 3 puzzles in Level 2. They include The Statue of Liberty, The Periodic Table, and The Solar System. No pieces to loose! Great for road trips, or those 'waiting times'. Small enough to put in a purse or bag for on the go. I love having things for my kids to do if we are waiting in the doctor office, and this is great for a variety of ages. Check them out on these social media outlets. See some of the other puzzles in action by clicking on the banner below. 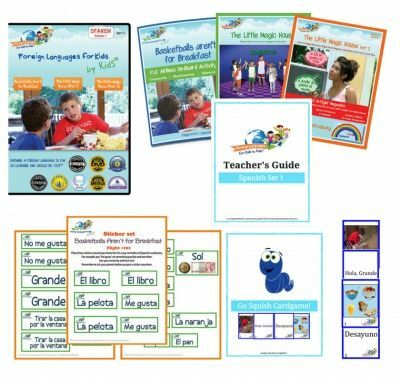 Spanish Program Starter Set 1 was educational and fun. It utilizes the immersion method, and is based on an 8 part video series. We started in Level 1 as Maverick hasn't had any exposure to Spanish. The DVD caught his attention right away, even though he hadn't a clue what they were saying. As I sat down to write the review he says "Make sure you write that I love it, it is so much fun". Well there you go! The DVD is the main portion of the set. I loved how it was a physical video, and didn't have to be watched online. This really helped with our having to utilize the internet in rotation so that the kids can get all of their school work done on our slow speed internet. "Basketballs aren't for Breakfast", was the title of our first video. The entire video is 12 minutes in length. The teacher guide is wonderful. It is very detailed on what exactly I need to do. It starts with watching the DVD, and for how many minutes. It includes the Spanish words that are going to be used in the video. You work up to watching the entire video, and learning what each word or phrase they are saying means. My 8 year old loved watching the video over and over again. My older kids in the same room, not so much. I definitely find this best for elementary aged children. Each lesson has additional activities that you can utilize as well. There are games that use the flashcards. The flashcards has actual photos of the video segment on them. It is easy to compare what they are getting across since it is consistent. If you haven't watched the video, the flashcards really won't make any sense. My 8 year old picked right up on seeing the scene from the video, and remembering what Spanish they were speaking at the time. I found that outstanding! Additional activities include learning about Spanish speaking countries. We start off on a trip to Peru. The videos are made to simulate being 'in-flight entertainment' on your way to a Spanish speaking country. The workbooks with additional games and fun are like the on board magazine typical on flights. There is a consistent flight theme through out the Starter Set 1. The Rapid Review game has the student calling out the Spanish words from the video, just prior to them saying it! It's like beating the actors to the punch, and memorizing what they are going to say next. Young students find this funny that they can say it before the actor! The books that come with the set, including the workbooks and the teacher book, are made of a high quality paper. Again the workbook uses actual photos from the video to help the kids learn the Spanish words. The stickers have a Spanish word on them, and are great for placing around the house. Luckily for us we have a basketball player in the house and could put a sticker on his ball! Maverick went to church on weds night telling everyone that "Me Gusta Pizza"! 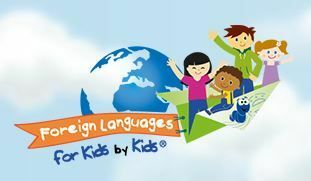 See what our Crew Mates thought about Foreign Languages for Kids by Kids by clicking on the banner below. I love that there is a panda, brown bear and polar bear. I think this is a great look at adoption even! 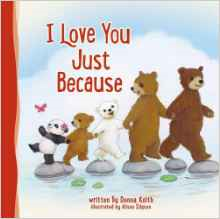 It never says in the book either way, but with the variety of types of bears in the family, it definitely lends itself to being a story about loving the child no matter what, whether they came through birth, adoption or even foster care. I found this to be a great pro family book, where family just loves each other. My young daughter loved the bears in the book! It was just darling to watch her turn the pages and tell me where the bears were. The text was short enough to keep her attention while she looked for the bears. I was so excited to receive The Illustrator's Notetaking Bible! This bible has two wonderful applications that I have enjoyed recently in separate bibles. Wide, lined margins for note taking and illustrations for coloring. The illustrations are varied and include images like these so you can do a complete illustration along with the scripture. In between books of the Bible there are complete,who page designs that you can color as well, just to add more color and character to your Bible. There are many pages through out for writing down your notes and thoughts as well. I have several Bibles, each for a different study I might be doing, or a specific hobby I am working on. I find that having a Bible to write notes in, and color in, makes an excellent heirloom for my children. As I read through the Word, I can jot notes and date them. Also they will have a record of some of my creative coloring work. I am not talented enough to take a notetaking Bible and turn it into a work of art on my own. I personally need the outlines to color to make it look nice. The illustrations are in a light gray, so you can easily add a different color over them if you choose. This Bible will keep you busy for awhile! The Illustrator's Notetaking Bible is in the Holman Christian Standard Bible version, HCSB. There are over 600 images to color, along with the personal space in the margin to write notes or dates. I appreciate that the margins are lined for organized notes. My children and I have taken to using notetaking Bibles during our morning homeschool Bible time. As they learn about different things in the Bible more indepth, they can write notes to help them remember. It also helps them stay occupied to have something to color as they go. I would love to see a Children's Illustrated Notetaking Bible! The Bible is 8.5 by 6.6 and has nice thick pages. These are not your typical thin, Bible pages. The pages hold up to colored pencils and some markers meant to not bleed through. I absolutely love this Bible! Nothing beats snuggling up with my toddler and reading God's word to her! She quickly bores of my reading from my Bible, but with the Snuggle Time Psalms, I can read the Word to her and she can see fun illustrations. Each page has a verse from a Psalm. 15 different Psalms represented. 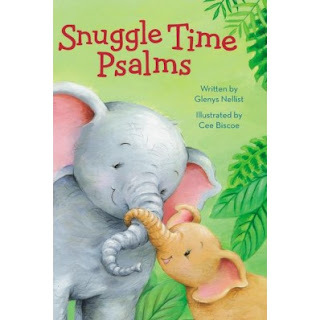 After the verse is quoted, the author offers a couple paragraphs you can use as a prayer, or an extension on learning about what the Psalm means. Illustrated bears, monkey, elephant, sheep, mouse, penguins and more! The illustrations really drew in the attention of my toddler. This book is great for getting your young one in the habit of a night time Bible reading and prayer before bed. My daughter looks forward to reading her 'Jesus book' each night as we tuck her in to bed. CTCMath has the most to offer for our large family. The CTCMath Homeschool Membership has replaced our other math programs across our ages. We love it so much that I actually took my other Math programs to sell in a book sale. If that doesn't show you how much we love CTCMath. The membership allows us up to 10 users! We aren't quite that big of a family, but we do currently have 4 children working on the program now. CTCMath is an online Math Curriculum that allows access to all the levels of math. You do not have to decide which grade might be best for them and be stuck in that grade. You can move around as your child learns. I can log into my Teacher account and see exactly how each of the kids are doing. One of the things I have loved at CTCMath is not having to grade their work. With homeschooling several children, I need to find short cuts where ever I can. Grading Math is very time consuming, and CTCMath takes away that burden from me. A new thing for CTCMath teachers is to assign Tasks. I can go through and assign particular lessons for each of the kids to have done on a specific day. If you need to keep your children on a particular time line, or just like to have that style of organization, this is something new to CTCMath. I don't choose to get that detailed, rather I have them do as many lessons that they can in an allotted time. So if it is a typically tough lesson, they may only get one done per day. If they are a bit on the easier side they may get more done. We just follow sequentially and that has worked great for us. In addition to being able to log in under the teacher account, I also get an weekly email update on how they are progressing. If they are progressing quickly and accomplishing much, I will get an email of an award they have received in their studies. CTCMath starts with Kindergarten and goes to 6th grade. After that are specific math studies rather than grade numbers. My oldest is currently finishing up Algebra 1 and will go into Geometry soon. I love that there is a video with each lesson, explaining how to do things, and there are plenty of examples for him to look at. Plenty of opportunities or me to learn it again as well when he needs help with a problem. He is still having to write everything down on paper to figure out the answer, and then input the corresponding letter into the answer key for grading. Each of the kids have their own log in credentials. This allows them to each be able to get to where they left off with CTCMath. I also have several of them doing math each day at the same time, on their own individual tablets. It works great on a tablet! It has gotten a lot easier for the student to see what they need to work on as well. If they get 80% then it will be checked off. They need 50% in everything to have completed that section. One additional thing I had noticed was that the student can easily see what sections they need additional work on, even from the main page. The numbers represent how many sections out of the total that have at least 80% correct. I know a lot of my focus has been on reporting, grading, and ease for the teacher. Where I am at right, that is of great importance for me. I have shared in previous reviews, our love for CTCMath. CTCMath will be our primary math for years to come! Check out CTCMath on these social media sites! Click on the banner below to see what other members of the Crew thought about CTCMath!